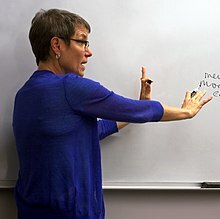 Sally Haslanger (/ˈhæslæŋər/) is an American philosopher and professor. She is the Ford Professor of Philosophy in the Department of Linguistics and Philosophy at the Massachusetts Institute of Technology. She held the 2015 Spinoza Chair of Philosophy at the University of Amsterdam. Having graduated from Reed College in 1977, Haslanger earned her Ph.D. in Philosophy in 1985 from the University of California, Berkeley. She has taught at Princeton University, University of Pennsylvania and University of Michigan, Ann Arbor. Haslanger was selected as the 2011 Carus Lecturer by the American Philosophical Association. The Society for Women in Philosophy named her a 2010 Distinguished Woman Philosopher, citing her as one of the "best analytic feminists" in the United States. Haslanger was the president of the Eastern Division of the American Philosophical Association and was elected to the American Academy of Arts & Sciences in 2015. In 2018, she was awarded a Guggenheim Fellowship. She co-edits the Symposia on Gender, Race and Philosophy, an online publication for recent philosophical work on gender and race. She is married to fellow MIT philosopher Stephen Yablo. Haslanger has published in metaphysics, feminist metaphysics, epistemology, feminist theory, ancient philosophy, and social and political philosophy. She writes that much of her work has focused on persistence through change; objectivity and objectification; and Catharine MacKinnon's theory of gender. She has done groundbreaking work on the social construction of categories often considered to be natural kinds, particularly race and gender. [better source needed] A collection of her major papers on these topics appeared as Resisting Reality: Social Construction and Social Critique (Oxford University Press, 2012) which won the Joseph B. Gittler Award of the American Philosophical Association in 2014. This prize is given for an outstanding scholarly contribution in the field of the philosophy of one or more of the social sciences. Theorizing Feminisms: A Reader (co-edited with Elizabeth Hackett), Oxford University Press, 2005. Adoption Matters: Philosophical and Feminist Essays (co-edited with Charlotte Witt), Cornell University Press, 2005. Persistence: Contemporary Readings (co-edited with Roxanne Marie Kurtz), MIT Press, 2006. Resisting Reality: Social Construction and Social Critique, Oxford University Press, 2012. ^ "MIT philosophy faculty: Sally Haslanger". www.MIT.edu. Retrieved June 11, 2017. ^ Universiteit van Amsterdam. "Spinoza Lecture: Ideology and Materiality – Faculteit der Geesteswetenschappen – Universiteit van Amsterdam". uva.nl. Archived from the original on April 2, 2015. ^ "CV" (PDF). Sally Haslanger. Retrieved July 7, 2018. ^ a b "MIT SHASS: News 2010 – Haslanger receives two major philosophy awards". MIT.edu. ^ "Eight faculty members elected to the American Academy of Arts and Sciences". MIT News. MIT. Retrieved May 27, 2015. ^ "Sally Haslanger". John Simon Guggenheim Foundation. Retrieved July 7, 2018. ^ "Gender, Race and Philosophy: The Blog". Gender, Race and Philosophy: The Blog. Retrieved June 11, 2017. ^ a b "Sally Haslanger". Retrieved July 7, 2018. ^ "MIT philosophy faculty: Sally Haslanger". mit.edu. ^ "Joseph B. Gittler Award – The American Philosophical Association". APAOnline.org. ^ "Oxford University Press book page". OUP.com. Retrieved June 11, 2017. ^ "Cornell University Press". Cornell.edu. Retrieved June 11, 2017. ^ Haslanger, Sally Anne; Kurtz, Roxanne Marie (June 11, 2017). "Persistence: contemporary readings". Bradford Books/MIT Press. Retrieved June 11, 2017 – via Open WorldCat. This page was last edited on 22 October 2018, at 15:11 (UTC).